Medical Technology Products, Inc. specializes in the design, development and manufacture of robust, rugged, and user friendly volumetric intravenous infusion pumps, used by all sectors in the medical community. 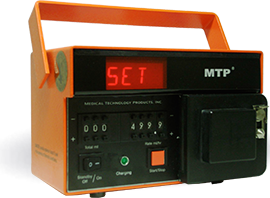 A global industry leader in the Emergency Services Market, when advanced life support is critical you can rely upon MTP. When infusion performance and reliability are critical during patient transport, or even for use in the home or hospital, the MTP has proven itself to be the pump of choice. The qualified transport infusion pump for the U.S. Air Force, Canadian Air Force and many state and municipal police and fire rescue agencies. Founded in 1982 and still committed to providing the infusion market the most reliable devices manufactured to U.S. Military standards. Do you have an urgent question about our products? Do you want to report a product complaint? Please contact our service department. Talk to one of our product specialist today!